The School of BioSciences maintains a number of state-of-the-art facilities, equipment and resources which are available for use in research. Some facilities (i.e. 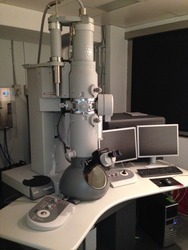 Advanced Microscopy Facility) are also accessible to the wider scientific community in government, business and industry. 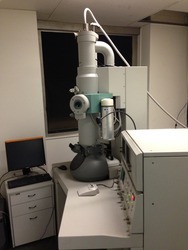 The University of Melbourne maintains a state-of-the-art electron and optical microscope facility with nodes located at the Bio21 Institute and the School of BioSciences. Instruments at these nodes are available to research students and staff of The University of Melbourne, as well as to the wider scientific community of government, business and industry. This state-of-the-art TEM is designed for the high-contrast imaging of biological samples or nanomaterials. Equipped with a 4k x 4k camera it is primarily used for high resolution imaging. The instrument is equipped with a cold stage to allow the imaging of rapid frozen samples, and can perform 3D Tomography at room temperature or cryo conditions. This workhorse TEM is a high throughput instrument for the routine imaging of biological samples or nanomaterials. It is equipped with a 1k x 1k digital camera for rapid imaging and surveying of large sample areas. We have two Leica ultramicrotomes for the sectioning of resin embedded biological samples to produce sections down to 50nm thickness. In addition we have a resin block trimmer to rapidly produce a block face in the area of interest, and a knife maker to produce glass knives for microtoming. This instrument has a field-emission electron gun (FEG) providing much greater resolution than conventional SEM’s especially at lower voltages. 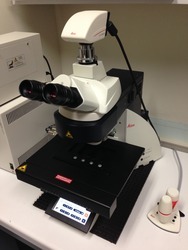 This enables the high resolution imaging of fine surface details of delicate samples. We have a critical point drier for the drying of delicate cells and tissues, that prevents any shrinkage or collapse. 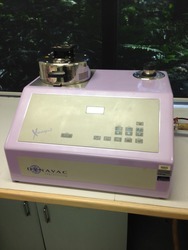 The drier has a large volume chamber for the drying of multiple samples at the one time. 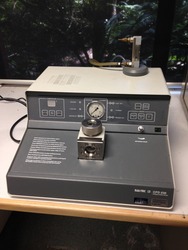 In addition we have a gold coater to make the dried samples electrically conductive. This instrument has a high-vacuum chamber and rotating sample stage to produce super-fine coatings of gold uniformly over the surfaces of biological or materials samples. This inverted confocal microscope produces very sharp images of the fluorescence produced by cells that contain fluorescent probes or markers. The images are produced by scanning a laser beam with a particular wavelength across the samples and collecting the emitted light. By collecting images of the fluorescence at multiple Z positions and stacking them together 3D reconstructions of individual cells can be made. This state-of-the-art instrument produces super-sharp fluorescent images by excluding out of focus light using pinholes – much like a laser scanning confocal. In this instrument, however, there are hundreds of pinholes arranged on a spinning disk that greatly enhances the fluorescent signal and resolution in the images. It has key advantages in its acquisition speed and in the reduction of photo-bleaching of fluorophores making it ideal for short or long-term experiments. This new fluorescence stereo microscope has a large zoom and magnification range, allowing details as small as 2 microns to be resolved. Its fully motorized stage allows precise movements that enable maximum focus to be obtained on the smallest of structures. The instruments revolutionary MultiFocus software allows the automated acquisition of dozens of images at incrementally changing focal planes. The software then automatically selects only those areas of each image that are correctly focussed and combines them to create a perfect image with no loss of depth of field. This new fluorescence compound microscope is equipped with the very latest in advanced technologies. It operates with a motorized Z-drive, motorized objective turret and a fully motorized X & Y stage. 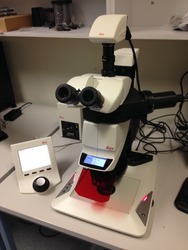 It is equipped with all incident light methods such as brightfield, DIC, phase contrast and fluorescence microscopy. The microscope is supported by powerful software that allows the user to run complex imaging experiments that combine variables in X & Y position, Z-height, illumination conditions, and points in time. 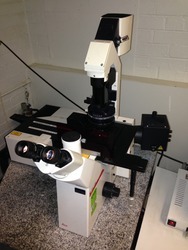 Once the parameters for an experiment have been set the fully automated microscope runs the imaging sequence without the need for the user to be present. The Glasshouse complex is located as part of the Zoology Building. There are 9 separate glasshouses located on the first floor of the complex. These can be accessed by internal and external stair wells and an elevator. Two glasshouses are classed PC1 and serve for plant pathology experiments. Growth rooms & cabinets - Three growth rooms are available for use. These have both lighting and temperature control. A further 3 growth cabinets are available with temperature, lighting and relative humidity control. Hardstand - An external pot standing area is available for the growing of potted plants. Ground plots - A small area on the edge of the systems garden is available for in ground growing of plants. This area is small and space is limited. Potting shed - This is a work area for the preparation of potted plants. Soil mixing and sterilization facilitates are available this is also the pot, soil, sand and soil additives storage area. Established in 1926 by a donation of plant specimens, the Herbarium collection now totals approximately 100,000 specimens - and its still growing. All major plant groups are housed in the Herbarium, including fungi, mosses, liverworts, lichens, algae, ferns, gymnosperms and flowering plants. The main emphasis of the collection is Victorian flora, however, for some plant groups interstate and overseas collections are included to adequately cover the range of variation within the group. Being an archival plant collection of international importance, the Herbarium contributes substantially to the School of BioSciences through research, teaching, public relations and the exchange of specimens and information locally and globally. The herbarium lends specimens nationally and internationally to registered scientific institutions for research purposes, and welcomes the use of the collection by visiting scientists. Through undergraduate courses, volunteer and internship programs students can learn about herbaria and assist in the maintenance and expansion of the facility. Melbourne Pollen Count forecasts the level of pollen in the air during Melbourne's peak allergy period from October 1 to December 31 each year. The School of BioSciences and the Asthma Foundation Victoria offer this service as research has identified that grass pollens released during this period are the major contributor to allergies in the outdoor atmosphere of the city. Metabolomics combines high-throughput analytics for the detection and quantification of metabolites in biological systems. At Metabolomics Australia (MA) we provide sustainable, state-of-the-art metabolomics research for all life sciences from agri-biotech and the environmental sciences, through to bio-nutrition, biomedical and health. MA is a national platform funded under BioPlatforms Australia through the NCRIS (National Collaborative Research Infrastructure Strategy) program with the hub located at the University of Melbourne, School of BioSciences and the Bio21 Institute for Molecular Science and Biotechnology. We offer an advanced analytical facility providing state-of the-art metabolomics infrastructure, access to expertise including bioinformatics and cover a wide range of metabolite chemistries and quantitative analyses required for comprehensive metabolite profiling. The Tiegs Museum of the University of Melbourne, established in 1887, is Australia’s oldest university museum of zoology. The collection, accumulated over 120 years, has specimens contributed by the first Professor of the department, Sir Walter Baldwin Spencer. It has an extensive collection of specimens representing the whole animal kingdom, ranging from small invertebrates to prepared whole-mounts and skeletons of vertebrates including an African lion, and a moa (an extinct emu-like bird from New Zealand). WildlifeDensity is a Mac OS X based program designed to help field workers estimate the densities of many biological populations in land habitats, particularly birds and larger mammals. It uses distance data from either line transect or fixed observing point surveys to model change in visual detectability with increasing distance from an observer. If the sample size is adequate, and appropriate information available on the observing situation, the model is then used to estimate the overall population density, its confidence limits, and other parameters of the observing situation. It can also estimate the proportion of the population detectable along a transect line. The program uses either radial distance or perpendicular distance data from ground-level or aerial surveys. It can also obtain estimates using data from a selected range of distances; observations on the transect line itself or at the observer's position are not necessary, nor is complete detectability along a transect line The procedure is relatively straightforward to use with many populations of interest, including many active, highly mobile species for which relevant data on movement rates are also available, and those well above or below an observer's position. To run, WildlifeDensity requires an Apple Mac desktop or laptop computer (Intel or PPC) with at least OS 10.4 installed, the more recent version the better. Selecting Version 2.2 TECHNIQUES MANUAL AND USER’S GUIDE downloads a .pdf file that contains the guide to field procedures, software operation and design. WildlifeDensity has been developed and made available as a service to wildlife managers, their contractors and staff, ecologists and other researchers and field workers engaged in the study or monitoring of natural populations. WildlifeDensity is freeware: that is, the program is licensed free of charge. It has been made available as a potentially useful tool, but without warranty of any kind, either expressed or implied, including fitness for any particular purpose. The entire risk as to the quality and performance of the software rests with the user who, should the program prove defective, will assume any costs associated with their use of the software. Under no circumstances will the copyright holder or any other party who may redistribute the material be liable to the user for damages. The user is free to download and use one or more copies of the program without charge, either for their own use within a scientific research or monitoring program or for student use within a teaching program in a tertiary education course. WildlifeDensity may not be sold or incorporated within any other program which is to be sold, nor may it be modified and redistributed without the written authority of the copyright holder, and with that redistribution taking place without charge. WildlifeDensity is updated on a regular basis. Please check back occasionally to ensure you have the most recent version installed (version number is included in the filename). ©Copyright 2018, School of BioSciences, The University of Melbourne, Victoria 3010, Australia. The Wilsons Promontory VirtualHerbarium website provides access to a significant collection of plant and algal species from Wilsons Promontory National Park. It is a publicly accessible online resource for the use of field naturalists, researchers and students of botany and related disciplines. Species pages of almost 500 taxa from 124 families are presented, with images and information about the distribution, descriptive features of the plant, as well as links to additional information, maps and images. You can search for species by various features, including name, flower colour and habitat.